If you're going into the gym armed only with a traditional fitness tracker like a Fitbit or Jawbone, you're selling yourself short. That's the argument from companies like Orangetheory, a workout regiment currently heading towards cult-like status in the US and beyond. Orangetheory is an intense 60-minute, instructor-led, full-body session that involves running, rowing, free weights and floor exercises while harnessing the power of interval training. Users who spend the targeted 12-20 minutes in the orange and red zones (84% max heart rate and up) will burn upwards of 500 calories per session (I averaged almost 900). Each minute in the orange zone or higher earns a "splat point," which can be tracked over time. Orangetheory existed before wearables, but the addition of a chest strap and more recently a wristband (and soon a forearm monitor) have resulted in an explosion in its popularity. "The wearable is now the cornerstone of everything we do," says CEO Dave Long, who is adding 300 studios around the world in 2016 and currently selling 50,000 wearables a month. "The principles of the workout were always there, but it was a huge boost to validate the science behind it and give people quantifiable results, so they know when they were doing too much or not enough." Because of the nature of the workout, users hitting the targets should also experience up to a 400-calorie metabolism after-burn in the 24-36 hours after the workout. This is because the routine is designed to push the body to excess post-exercise oxygen consumption (EPOC). Essentially, you're doing more, in less time, with continued benefit after the workout. You could have two guilt-free beers the next day knowing yesterday's workout is already burning them. What's not to love? As an extremely lazy gym goer who struggles to find motivation, my week training with Orangetheory was a revelation. I found the wearable aspect was great for holding me to account. I could no longer coast through a 25-minute gym session and kid myself that putting two feet through the door was enough. The effort I was putting in was displayed for all to see on the team system, shaming me if I wasn't giving it a solid crack. It dawned upon me that, if I had been wearing a HR monitor in the gym, I would be a permanent resident in the green zone (77-83% of max HR). Moderate. Comfortable. Maintaining, but not improving. This workout got me uncomfortable again, and not just because of the very un-British group high-fives. Post workout, reading back my stats on email or through the app allowed me to come out of that one-hour session with the reward of knowing that I'd nailed it and seeing the improvements. That had me eager to go back for more – and that's key for gyms. After all, this is scope for constant, quantifiable improvement. The fitter you get, the faster you have to run or row to see the little orange LED flashing on the $100 wristband, which also functions for workouts outside the studio. Personally, I'm not sure how long I could tolerate the obnoxiously loud dance music and boot camp vibe, but after these workouts I felt something I hadn't experienced in a long time: reward. There's a similar argument from MyZone, another company seeking to transform the way we work in the gym and change the way gym operators feel about wearable tech. MyZone offers the MZ-3 chest strap and sports bra (plus soon a compression shirt) that track only heart rate, which it says is the only truly reliable metric when it comes to gym-based activity. You may have seen MyZone in your local gym, but here's how it works. Each chest strap ($150) wearer has their own personalised square on a big display within the gym. It shows their percentage of maximum heart rate, current HR, calorie burn and MEPs (MyZone Effort Points), the currency used to determine the amount of effort you're putting in. Each square is colour coded. The cooler colours, green and blue, represent lower levels of heart exertion, while yellow, orange and red are higher intensity. That information can also appear on an accompanying watch, the mobile apps and, by extension, wearables like the Apple Watch and Android Wear devices. For demoralised and bored gym goers, often surrounded by hulking beasts stacking the bar and smashing out pull-ups like they're underwater, using effort as a metric to help track quantifiable improvement is huge. "We've always said, we're not the best wearable in the world. We're the best wearable for the gym goer," said MyZone president and co-founder Emmett Williams. "If you go to the gym you are not just running or cycling in a rhythmical fashion. You're jumping on boxes, pulling yourself up on a bar, pushing yourself away from the floor, and so on. "There's an infinite permutation of moves and the lowest common denominator is the beat of your heart." "We've gone with the chest strap because it's 99.4% accurate to an EKG. Even the Fitbit website will tell you, if you are doing non-rhythmical activity such as P90X or burpees or clenching your fist, the reading will become inaccurate. "We stick to accuracy we believe if you lose accuracy, you lose relevancy and as soon as you lose relevancy you lose engagement." MyZone is becoming the heartbeat at 3,000 gyms and health clubs around the world. Gyms are selling the chest strap direct to consumers and investing in the infrastructure as part of an overdue digital overhaul. It's all in the hope of keeping members engaged in an era where tech – especially wearable tech – has opened up more quantifiable workout options that perhaps threaten the market for a traditional gym or a personal trainer. "This isn't the Olympics," Williams said. "We're not measuring performance, we're measuring effort, which puts everyone on a level playing field. It's a bit like a golf handicap, but for exercise." "If you're really fit and I'm really unfit your cadence on the battling ropes is going to have to be twice that of mine to earn the same effort points." The concept of reward is one of the reasons many traditional gym operators, initially resistant to adopting wearable tech, are now flocking to solutions like MyZone. Williams regales with enthusiasm how Colgate practically doubled sales in the 1930s by encouraging people to brush twice a day instead of once. They added citric acid to the toothpaste, which gave brushers a pleasant post-brush tingle, triggering a desire to experience the sensation again. The same concept can be applied to gym workouts, he says. Rather than bored, unfulfilled, demoralised members cancelling way short of their goals, clubs get a longer tail from users, an enhanced "lifetime value" that's measured against the customer acquisition costs. "For many gym goers, it has become a chore," he says. "We're trying to provide the tingle in the toothpaste. When users get the trigger to exercise, when the alarm goes off at 6am, they want to do it because they have that reward coming." "Gyms have all the equipment, but we provide the secret sauce of gamification, tracking, feedback and meaningful insight," he added. Orangetheory's Dave Long agrees: "Even though they have these great programs, traditional gyms have struggled to get people motivated to stick with the right workout." 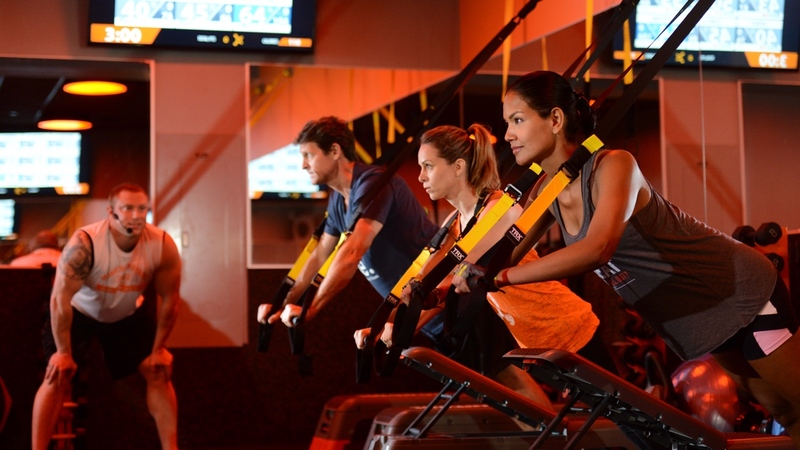 Both MyZone and Orangetheory are designed to allow instructors to turn workouts into a game, both in individual and team settings, providing that inspiration so often missing from our visits to the gym. "Or, they might say, 'we're going to jack our HR up and get it all to about 85% and then we're going to stop and we're going to watch your HRs drop on the big board for one minute." "That recovery number – the higher the better – is a key metric, it's meaningful insight. Gyms can work with their population and say 'measure this after every single workout and see that number get better.'" The data collected by the heart rate monitor, while greatly informing the gym goer, also has social ramifications. Both MyZone and Orangetheory apps have leaderboards, plus the ability to join challenges and share workouts to social media. MyZone also enables users to connect with each other, which it says is massively significant. "Our key message to the club is it's one thing for the members to buy the MyZone, download the app and get engaged, but you've got to get them to connect with other people," says Williams. "Then everything takes care of itself. We all do more when other people are watching, because the reward is being enhanced. We've found if a user has three social connections or more, they will exercise 33% more than they would have." Thanks to solutions like MyZone, clubs are less fearful that wearables can replace their services. On the contrary, if used correctly, they're a huge enhancement, a perfect example of the old 2+2 = 5 equation. Those who swim against the tide of the relentless shift towards the quantified self, risk extinction. "It has opened a completely new way to engage and communicate with their customers," says Silvano Zanuso, director of the medical & scientific department at Technogym, an open-source Mywellness cloud platform which allows users to access data from its connected gym equipment on their wearable devices. "This is a great business opportunity," he says. "Digital revolution is not an option for health clubs. Five years from now, the new customer will be the millennials, who live completely digital lives. Those unprepared for the transformation will be out of the market." Detailed discussions with both OTF and MyZone revealed not just a desire to spearhead a new era in quantifiable fitness regimes, but a refreshing commitment to educating the public. For the longest time going to the gym has been a lonely furrow, where we often find ourselves unsure whether what we're doing is really helping or whether we're doing it right. That no longer has to be the case. The ability to know we're on the right track through how hard we're trying and the measurable improvement that brings is exactly the shift needed, not only keep us coming back to the gym, but to actually look forward to going back tomorrow.